To visit the Boardrooms' Best full list of podcasts, click here. Independent Directors can keep relevant, by integrating their thinking across multiple industries, thus contributing more than the average board member. Guest: Michael J. Critelli, Board Member, Eaton Corporation; Director Emeritus, Wyeth Pharmaceuticals; Former CEO and Chairman, Pitney Bowes. 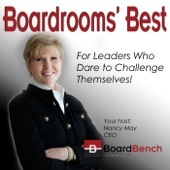 In this episode, Nancy May speaks with Mike Critelli, corporate director and former CEO of one of the most recognized Fortune 500 companies, about how he and his board peers bring out the best from the company leaders they oversee. And, when all this happens at once, how to remain morally courageous, in even the worst times. Michael J. Critelli serves on the board of Eaton Corporation and most recently served as Chief Executive, President and Director of Dossia Services Corporation, a personal and population health management systems company, from 2011 until 2016. In 2017 he served as the CEO of CloudParc, Inc., a smart cities and transportation technology company. He completed that assignment and retired as both an officer and director of CloudParc in December 2017. Mr. Critelli is the retired Chairman and Chief Executive Officer of Pitney Bowes Inc., a provider of global mailstream solutions. He served as Chairman and Chief Executive Officer of Pitney Bowes from 1997 to 2007 and as Executive Chairman from 2007 to 2008. Mr. Critelli served as a director of ProHealth Physicians, Inc. from 2012 until 2015. Director since 1998.